The face is extremely vulnerable to elements such as sun, stress, gravity and aging; these factors may cause unpleasant side effects such as lines, wrinkles and laxity of the skin. These changes can make a person look older than they feel inside, but luckily there is a surgical solution. Facelift improves the appearance of the face (and often the neck) by redistributing fat, smoothing lines and wrinkles and tightening loose skin. It may be combined with another facial procedure for an even greater transformation. 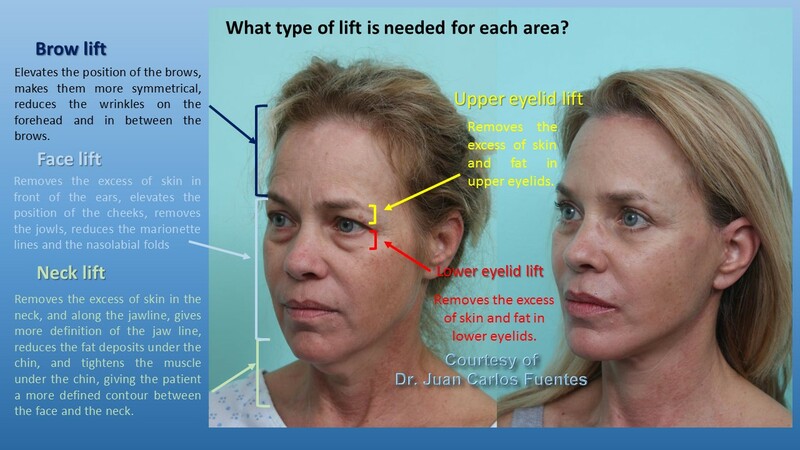 Most of Dr. Fuentes’ Mexico facelift patients are in their 40s or older when they decide to undergo the procedure. Facelift surgeon Dr. Fuentes makes small incisions at the hairline in front of the ear and extending under the earlobe to the lower scalp. Through the incisions, he tightens the underlying structures of the face, including the SMAS deep layer tissue and muscles. Dr. Fuentes stretches and tightens the skin and removes any redundant skin. He may redistribute fat to recreate youthful volume and contours. Or, Dr. Fuentes may incorporate liposuction of the neck and jowls to create a more attractive contour around the chin and neck. Once he is satisfied with his work, he closes the incisions with tiny stitches. Any scars from the incision lines will be well-hidden within the hairline or another area of the face so the scars are almost undetectable. A face lift surgery takes several hours, depending on each patient’s treatment plan developed by Dr. Fuentes. He may combine facelift with a brow lift or eyelid surgery to rejuvenate the eye area. The specific technique or approach that Dr. Fuentes uses is based on the patient and his or her unique needs. This will be determined during the patient’s surgical consultation. While recovering from facelift surgery in Mexico, patients are strongly advised to rest quietly at home for a few days and avoid unnecessary movement, heavy lifting or physical exertion. Any post-operative pain or discomfort can be treated with oral pain medication. Dr. Fuentes will check the patient’s progress after a few days, and remove the stitches within a week or two after the surgery. Any potential problems should be immediately communicated to Dr. Fuentes, who can check the patient and prevent the problem from turning into a complication. If you’re interested in what facelift can do for your appearance, please call (619) 202-4443 or email our plastic surgery Tijuana practice today to speak with a member of our team. Dr. Juan Fuentes is a well-known facial plastic surgeon, offerings procedures such as eyelid surgery, face lift, ear surgery and rhinoplasty in Tijuana. As a board-certified surgeon he is also skilled in a range of body contouring procedures and has helped countless breast augmentation, body lift and tummy tuck Mexico patients.